January 1, 2009 Canaan, NY -Happy New Year everyone. Looks like we've got a few new dates on the books. Please see the Dates Page for recent updates. Looking forward to going back to the Potawatomi Bingo Casino in February. We're also looking forward to some Ontario Dates in the summer and fall. Best wishes to all for a Happy 2009. We're all excited about Barack Obama being President! Well, sorry to say it's been almost a full year since I've updated this site. This doesn't mean we've stopped working . We've done some great shows over the past year and there are other developments as well. The LIVE IN ORLANDO project was picked up by Eagle Records and today is the release of the DVD! We are all very excited about this! The project is available as a CD as well. Please buy the product. The Dates pages are updated as of today as well, we've got some public shows on the books as well as some privates with Mary Wilson and the Spinners. Just realized that it has been months since I have said anything here. The main reason for the lack of road updates is that since I have taken over the road managing duties I am way too busy when on the road to take the time to write anything and then upload the page to the server. That being said, we have had a number of great shows in the past few months. Canada has been amazing, we've been on two seperate runs since I last wrote. The first was a 5 gig stint in April and the last was the two night stand at the Fallsview Casino in Niagara Falls. Just amazing! that's all that can be said of the Niagara Falls venue and hotel. If you have the chance to go, do so! Eddie, Babbitt, Marcia and I are here in the Detroit area. I had the pleasure of presenting Eddie and Bob with copies of the Live in Orlando DVD! Let me tell you, that was a nice feeling. Tomorrow we hit the road for the Ontario run. It should be cool. See you on the road! I have been very busy lately working on trying to wrap up our DVD. It is almost done and should be ready by the time we hit Canada for the spring tour. The Canadian dates are on as well as a few US dates so check out the DATES page for some links to the venues. Services for Joe Hunter, the jovial, popular pianist who accompanied artists like Jackie Wilson and then was Motown's first Funk Brother, hired by Berry Gordy Jr. for his Motown Records studio band, were set by his family. Hunter died last week; he was found in his Detroit apartment on Friday by his son Joe Hunter Jr. Hunter had just returned from a brief European tour. Viewing will be 4-8 p.m. Thursday and Friday at the Barksdale Funeral Home, 1120 E. State Fair in Detroit. Friday night we are asking all musicians to meet us at Bert's Market Place 2727 Russell Street, Det. MI. 9:30 p.m. We are going to jam for Papa Joe. The funeral will be at 11 a.m. Saturday at the Little Rock Baptist Church, 9000 Woodward Ave in Detroit. It is with a heavy heart that we hear the news of Joe Hunter's passing. Joe was found by his son at his apartment in Detroit the other day. Joe had apparently been dead a few days. Joe had recently been on tour in the UK with Jack Ashford. There are a few obituaries out there. I'm a little late with this news as I was on the road for a couple of days. USA TODAY , NEW YORK TIMES , DETROIT NEWS , All three obit's are the same AP wire. 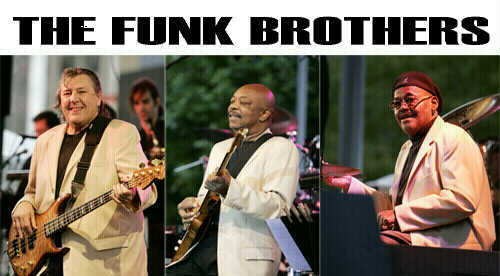 There are now only 5 original funk brothers remaining alive. They are: Uriel Jones, Joe Messina, Eddie Willis, Bob Babbitt and Jack Ashford. Let's pray that nobody else leaves our presence for many years to come! On a lighter note, I have been working on the Funk Brothers Live in Orlando DVD and it's almost ready. So hold tight, more news to follow in the near future. Meanwhile the "A Soulful Tale Of Two Cities" disc is out. Go to www.soulfultale.com for details. Well, It's been a while since I've written anything here............. There was a Corporate show on December 1st in Washington DC that the band played with special guest Diva MARY WILSON. What a great show! Mary was stellar as always and her entourage was a treat to work with. Mary's manager is now working with us and this was the first show we've done since he came aboard. Thanks to Jeff Vee for producing such a great event. I am about to go into the video editing suite to produce the New Years Comcast DVD from last years show at Universal studios in Orlando. I remixed the audio in september and Bob Olhsson has mastered it. Bob was a longtime Motown engineer and it is a treat to have someone of his stature finalize my mixes. More on this project as it comes to fruition. If anyone has label connections please contact me ASAP as I am going to be shopping this project for major label distribution in the near future. I am at the airport in Austin. I stayed a couple of extra days because I have a few really good old friends here in Austin. I saw a couple of guys I used to tour with back in the late 80's. We were all crazy kids back then so it was pretty strange to see them after such a long time. Check out what my buddy Troy Campell is up to...... Collection Agency Films In addition to this film stuff Troy is also a great singer songwriter and a hell of a guy. Anyway, On to the show we did on Friday. It was a wonderful night here in Austin on Friday. The venue is a beautiful place. The One World Theatre is about a 250 person tiny theatre run by some really nice folks. Thanks to Hartt, M.J. Kevin, Pat and especially Marcus who helped me out in huge ways to make this show a resounding success. Thanks to Cat the merch lady. Buddy Miles stopped by to see the show and wound up onstage for an extended version of "My Girl". It was just a great night. If you missed it, you missed a really good night. I rate it among the best shows I've done in the past year and a half with the band. Back From the Detroit Jazz Festival Trip......... Wow! what a cool week this has been. It started off with Bob and I meeting at the Airport on Wednesday, The day before the rest of the out of towners arrived. We had made plans to remix the Comcast broadcast materials from the 2005/2006 New Years Show at Universal city. Let me tell you something, it was one of the thrills of my career to be in the studio (Studio A in Dearborn Heights, Thanks to Todd, Eric and Marilyn) with Bob and Uriel. I really Wish Eddie had joined us, but he wasn't due to arrive until later in the day. I remixed the entire broadcast with Bob & Uriel co-producing and now I am going to sync it up to the video. Hopefully I will get this done in the near future so we will have some product to sell! I am also going to master a CD out of this as it sounds really nice. On to the show......... It was stunning! Everyone gets quite pumped to perform in front of the hometowners and the performance showed this enthusiasm. As Jeff, (the house soundman) said "They are MUCH better than last year" thanks for your help Jeff!. Thanks as always to festival director FRANK MALFITANO, There are none better than Frank!! Thanks for everything man! Thanks also to Brandon who has become the most frequently seen and best monitor man around. Also hats of to Dave Bartlebaugh of Aerial enterprises and Neil V. of NV rentals. 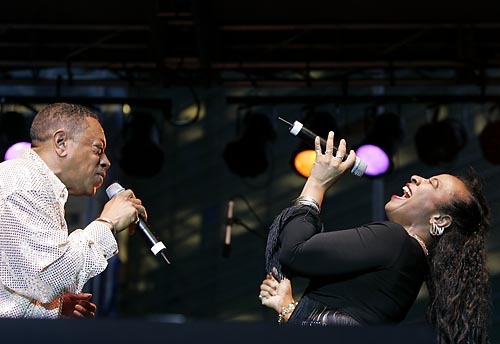 "The Detroit International Jazz Festival continued Friday night with a Motown Throwdown. 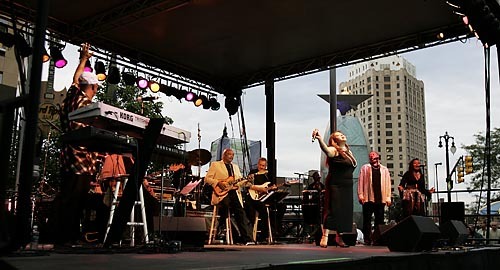 As cool breezes wafted up from the river, the rhythmic, soulful music that made "Motown" international shorthand for Detroit echoed around the looming skyscrapers lining Campus Martius Park. 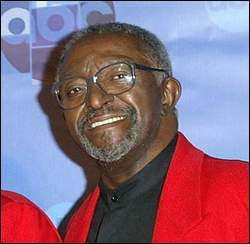 First the Funk Brothers, the group of Motown-backing musicians lauded in the "Standing in the Shadows of Motown" documentary, chugged through a set including the Temptations' "Get Ready" and "(I Know) I'm Losing You," Stevie Wonder's "Signed, Sealed, Delivered," and the Supremes' "You Can't Hurry Love," among other West GrandBoulevard hits. 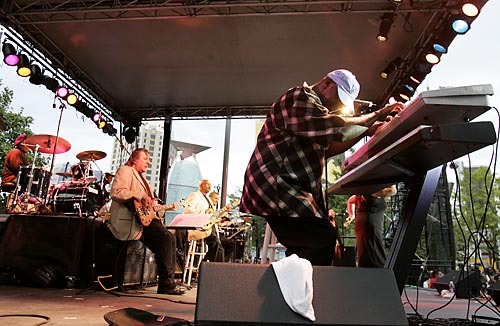 The 2006 Funks are now pared down to three of the Funk Brothers from the film, but Delbert Nelson's gritty vocals warmed up the growing crowd in Campus Martius for Dennis Edwards & The Temptations Revue to take it home --literally." We are in Boston playing Scullers Jazz club again. This is a return engagement and we love it here! Nice people run the club and it's really nice to be able to stay at the venue. Wow!!!!!! What a show tonight. It's just amazing sometimes what music can do. Tonight was one of those magical nights, The band was on, the venue was beautiful and so were the people. A great night. The Funks put on a show for the ages tonight in providence and were rewarded by the Mayor with keys to the city. This bodes well for the bands return to the area next week when they play Scullers on the 28th & 29th. If you are on the east coast, plan on coming to the shows in Boston because if tonight was any indication the shows are sure to be great. The band is really pumped up about the Philly Soul project that they recorded a couple of months back and is just being released. The project is called "A Soulful Tale of Two Cities" check it out and BUY the product. Moreover, if you see the acts playing in your area, go see them. Support live music! Here's a version of "What's Going On" from tonights show in Providence, Rhode Island. I've been lax in posting lately. The Funk Brothers have been busy in the studio recording the Philly Soul/Motown record that has been getting a lot of press. I'll post some links to this stuff in the next week. The Austin Texas date on May 26th has been cancelled for reasons beyond the bands control. The Funk Brothers express their dissapointment to fans in the Austin area that were planning on attending. All other dates on the schedule are still on. New Dates entries: See Dates page! If you watched the Jimmy Kimmel Show you will know that the guests that night were Anthony Anderson and Jessica Alba. When the Funks Hit the stage both of them were standing on the riser where I was mixing the band. Here are the pictures I took of them. The Two nights at foxwoods went very well, Thanks to all that attended. The band was promised a return engagement sometime in the future by foxwoods management. I didn't have any internet access while there so I couldn't post while we were there, sorry about that. Next gig is in Naples Florida in late March. Back home after a long road trip, I had been on the road for almost 3 weeks. The last leg of my trip was with the Funk Brothers in Detroit. We had a blast! This is so much like an extended family, It's really wonderful working with this group of people. Hopefully some of you were able to catch the Jimmy Kimmel show, It was really cool to get to do that and after watching, I think the Funks did a great job. Hopefully they'll get the Funk Brothers songs online soon so you can stream the stuff that didn't get aired on the broadcast. On Saturday the 5th we did two shows. The first one was in Detroit at the beautiful Masonic Temple Theater. If you ever get the chance to see something at this venue, do so. The Funk Brothers set was 25 minutes long and was a great, but short rendition of the current show. We did a runner after the show to get to Novi, MI and the Taste of The NFL event. A "runner" means that you leave the venue immediately after your performance, and that we did. By the time I got to the bus everyone was in their seats and we took off immediately after I entered the bus. Straight to Novi, where the band went straight to the stage for a 70 minute set that had the crowd jumping. The band was exceptionally tight at this event and hopefully some of the big wigs that were there will see it beneficial to book the band at some more of these high class events. Lord knows the Funk Brothers only make a classy event classier! Thanks to everyone involved in this past weekends shows. I had some great Sound Crews at all three shows and it really helped make a difficult weekend easy. Yesterday the Funk Brothers performed on the Jimmy Kimmel Live program on ABC TV. The Four Tops, or what's left of them Sang a mini medley and then the Funk Brothers played out the show with "Ain't no Mountain high enough", Additionally the band played 3 more songs which you should be able to stream from the Jimmy Kimmel website in the near future. The people involved with the Jimmy Kimmel show were just wonderful and I'd like to thank Mac & Barry for all their help! You guys rock! Two shows to set up today so I have to run, if you're in or around Detroit I'm sure you know, THE MOTOR CITY IS ROCKIN'! Just Flew into the motor city on the red eye from Vegas. It's raining in Detroit but the city is hot. In the Motown shop in the airport there are posters for the big show at the Masonic Theater tomorrow night. Ford Field was lit up like a christmas tree in the early morning darkness. I am going to get to the Little Gem Theater early to set up for the Jimmy Kimmell Show performance tonight. Have fun watching the gang tonight! I had a prior commitment and had to miss the show in Gainseville, Florida. I hear it was a great show. Eddie told me on the telephone the other day that the brothers received a special citation from the city and the day of their performance was declared Funk Brothers day in Gainesville! That's awesome. I am currentlyin las Vegas and am preparing to head to detroit where the band has two shows which are happening in conjunction with Super Bowl celebrations. The First show is happening at the Masonic Temple and is a big Motown celebration which also featured the Dramatics and JAMIE FOXX!! "C all the Motown Music Fest the something old, something new Motown revue. Jamie Foxx, Nelly and John Legend will share the stage with the Four Tops, Miracles, Contours, Dramatics and Martha Reeves and the Vandellas during two shows on Feb. 4 at the Masonic Temple in Detroit. Foxx may perform a couple of Ray Charles tunes as well as songs from his CD, "Unpredictable." 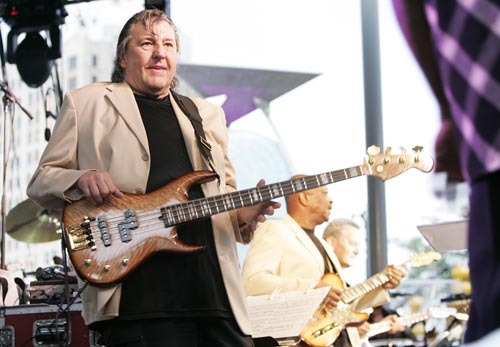 The legendary Motown house band the Funk Brothers will play for many of the featured artists. The first show featuring Foxx, Nelly, Legend and the Dramatics will get underway at 8 p.m." Tickets available through TicketMaster. I also found an article on Billboard magazines website. The Second Show is an NFL Private Party in Novi, MI. ON FRIDAY February 3rd the band will be performing on the Jimmy Kimmell show so set your VCR's and Tivo. If someone has the ability to record this to DVD for me I would really appreciate it. Please contact me through the email link on my www.steinbergsound.com website. The New Years Show was a resounding success from our standpoint. The Band was tight and I had a great time too as the gear was top notch. Although we had obstacles to run through with the logistics of this show everything went off without a hitch. The band played Rod Stewarts "Motown Song" for the first time and the reception for it was great. I enjoyed being able to mix Gloria Gaynor too, Her Song: "You never can say goodbye" is just disco era classic. The Funk Brothers are without a doubt the greatest backing band EVER! The next gig is in Gainesville, Florida on the 21st. After that show the band has a couple of dates surrounding Super Bowl activities in Motown on February 4th 2006, details as they become available.